Dr. Melissa Fry, director of the Applied Research and Education Center, presents her Vision 2025 report to end homelessness in Clark and Floyd counties. NEW ALBANY, Ind. — How can one end homelessness in Southern Indiana? It’s a loaded question with no clear-cut answer, but Indiana University Southeast is playing an instrumental role in bringing the discussion to light. IU Southeast co-hosted a public forum with the News and Tribune titled “Facing Homelessness: A community conversation” on Tuesday night at the Ogle Center. The forum featured a panel of four community experts on the issue. Christine Harbeson, director of Hope Southern Indiana; Kelley Curran, Jeffersonville Homelessness Task Force and planning committee member; Beth Keeney, senior vice president for Community Health Initiatives for LifeSpring Health Systems and IU Southeast alumna; and Leslea Townsend, social services director for St. Elizabeth Catholic Charities, fielded questions from members of the community in attendance. Dr. Melissa Fry, assistant professor of sociology and director of the Applied Research and Education Center, had played a key part in the News and Tribune’s Facing Homelessness series, and she presented the Vision 2025: A Strategic Plan to End Homelessness in Clark and Floyd Counties report that she authored. The goals of Fry’s report are to make homelessness a temporary, transitional experience supplemented by access to services to help people back on their feet. “It helps the community, but it also helps the university because our students learn a tremendous amount from seeing us engaged in that way,” Fry said. 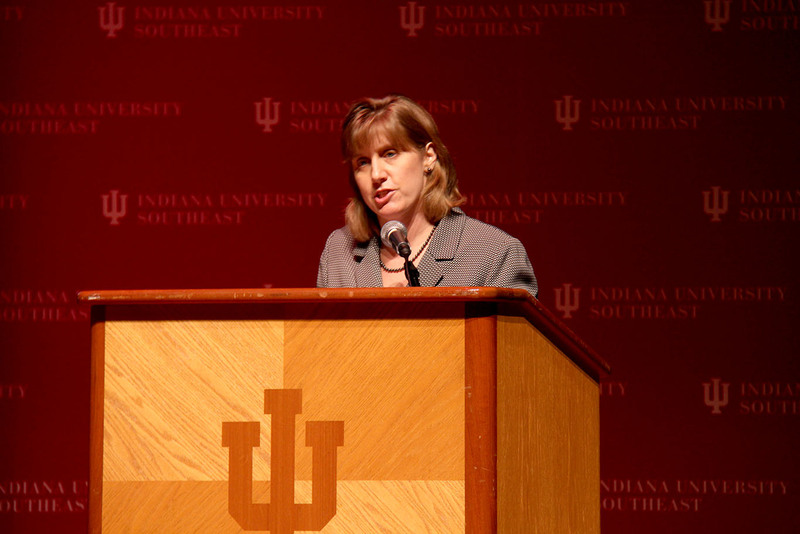 “The students at IU Southeast are the future leaders of this community. Our students stay here, they live here, they become the leaders in these organizations. For a full recap of Tuesday’s “Facing Homelessness” panel, visit the News and Tribune website.